If you want to keep your dog's nails trimmed without having to make expensive visits to the groomer, consider trying a nail grinder. Nail grinders are affordable, widely available, and fairly easy to use if you follow a few basic directions. Nail grinders either have a power cord, or they're cordless and battery operated. Each grinder has a cylinder-shaped body with a grinding head on the end that is used to shorten and smooth the dog's nails. While these tools are not particularly difficult to use, there are some safety precautions to take, as well as a few specific techniques you'll need to master in order to get professional looking results. Using a grinder can be dangerous, so the first thing you want to do is make sure there will be no hair in the way. If your dog has long hair, you need to band it back so there's no chance it can get caught in the grinder's spinning tip. If your dog has long hair on his paws and between his foot pads, it's best to trim it first to lessen the risk of catching it in the grinder. Hold the dog securely with his paw extended. Always be prepared to stop temporarily if the dog struggles, and you need to position him again before proceeding. Working on one nail at a time, gently apply the grinder to the bottom of the nail tip, and slowly bring it up and around to the top of the nail tip. When you reach the top of the tip, work back down to your starting point again. Repeat this process several times until you've removed the sharp tip, but not so much that you grind into the quick and make the nail bleed. When you've taken off as much length as you need to, gently apply the grinder in a circular motion around the tip several times to polish it smooth. Repeat the entire process on each of your dog's nails. There are several advantages to using a grinder versus a standard dog nail trimmer. Grinding is virtually painless when it's done properly, although your dog may need to become accustomed to the vibration of the grinder head against his nails. You can get a nice, smooth tip that looks quite natural, rather than the jagged tips that many trimmers leave behind. You're far less likely to expose the nail quick and cause bleeding. It can take some time to get the hang of using a grinder, and your dog might have some reservations of his own. You may have to accustom your dog to the sound of the grinder if he's scared of it. Do this by turning on the grinder and offering him some irresistible treats. This way, he can begin associating the sound with a pleasant reward. Grinding creates heat which may frighten your dog a bit. Be prepared to take your time and give your dog breaks the first few times you use the grinder. He'll eventually get used to the warmth, as well as the way the grinder feels against his nails. You can also work on each nail a little at a time to keep heating to a minimum. If your grinder comes with different size stones and grit sanding bands, you may have to experiment to find which one you like working with best. You can purchase a nail grinder at most pet supply stores as well as online. Amazon is a good place to look as are PetSmart and Walmart. The following grinders are recommended for their durability and performance. Since they all have low and high speed settings, you can use them on any size dog. 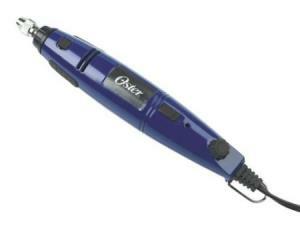 The Oster nail grinder is priced under $50.00, and it comes with a one-year warranty. Replacement parts are readily available. With over 300 customer reviews, this grinder is rated excellent by a majority of users. Positive comments included appreciation that the power cord eliminated the need for recharging the tool, the professional results, and the fact that dog owners no longer had to worry about cutting the nails too short and hurting their pets. On the downside, some customers said their dogs feared the sound of the grinder, and they didn't like the dust produced when grinding the nails. Dremel is a well-respected name in professional quality nail grinders. The Dremel 7300-PT 4.8-Volt Pet Grooming Kit is cordless, which makes it a little easier to maneuver while you're grinding your pet's nails. This grinder has two speed settings, so it's easy to adjust between working on large or small nails with just the amount of control you need. It runs on a 4.8 volt battery and comes with a three-hour charger. The Dremel sells for around $30, and it comes with a two-year warranty. Although not every customer was satisfied with this tool, it does receive high marks from most users based on 4,000 customer reviews. Positive comments included that some dogs didn't pull away from the Dremel like they did from standard clippers, and that the power on the low speed was enough to get the job done. With that said, some customers claimed the tool wouldn't hold a charge, and one claimed it was too difficult to put together. FURminator's nail grinder is a part of their popular line of products for dog nail and hair care. A dog nail grinder with guard is much less stressful for the pet owner new to grinding their dog's nails. The grinder has two speeds, is quiet and cordless for easy use. It also has automatic LED light making it safer to use. 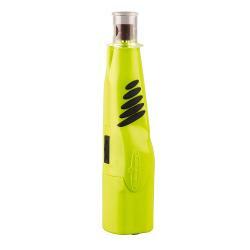 It uses four AA batteries, and a pack comes with the kit for immediate use. The Furminator sells for about $15 and comes with a one-year warranty. Out of over 700 customer reviews, the Furminator was well-liked by the highest percentage of users. Users appreciated the speed and power of the grinder and the rubber grips which keeps it from slipping while using it. They also liked the guard and the LED light for safety. Users with negative reviews claimed it was noisy, and the plastic casing felt inexpensive. 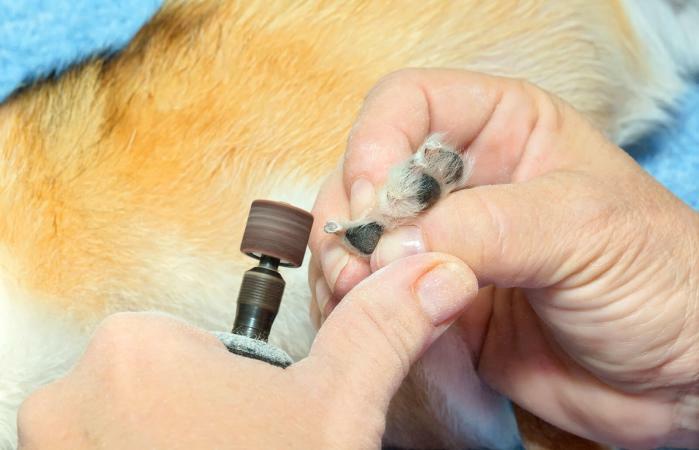 Will a grinder be the right solution for your pet's nail trimming needs? You really won't know until you use one. if your dog currently struggles when you try to use regular trimmers, you may find it worth your while to make a small investment in a trimmer, and see if your pet is less resistant to having his nails done. If you like the results, you'll know you've made the right choice.